Thomas G. Masaryk–sitting just to left of the crack of the Liberty Bell–Philadelphia, PA, October 26, 1918. 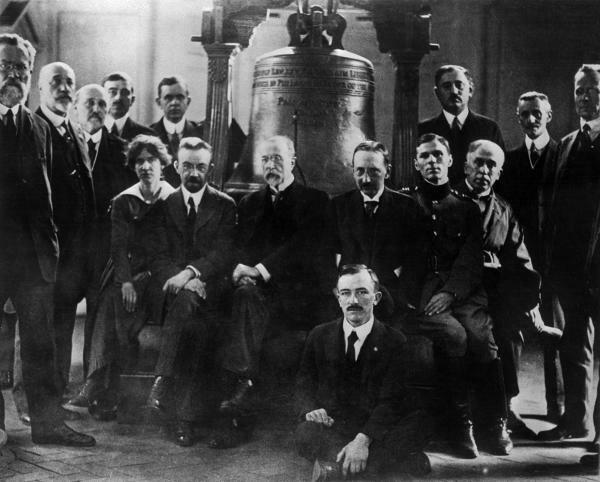 In October, 1918, Thomas Masaryk and representatives of participating nations gathered in Philadelphia to sign the Declaration of Common Aims of the Independent Mid-European Nations. On October 26, 1918, Masaryk declared Czechoslovakia’s independence from Austria-Hungary on the steps of Independence Hall.